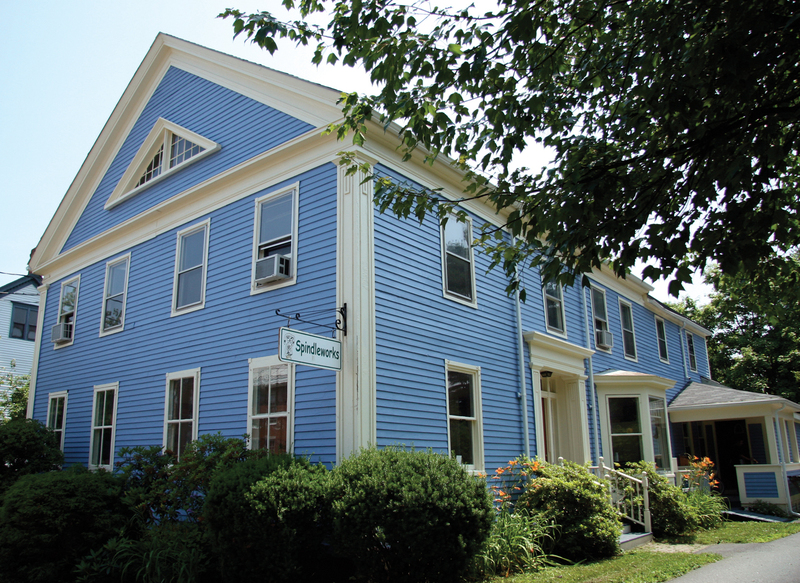 Spindleworks has been serving artists with disabilities in Maine for more than 40 years. Published on Thursday, September 14, 2017. This article appears in the August/September 2017 issue of American Craft Magazine. Diane Black – a painter, weaver, and instructor – works on a piece of her own at a communal table. These are fraught times for the arts. In March, President Trump proposed zeroing out funding for the National Endowment for the Humanities and the National Endowment for the Arts. Both emerged unscathed, and arts leaders heaved a collective sigh of relief – for this fiscal year. With Congress eager to slash spending, however, the prospects for the next few years are uncertain at best, dire at worst. Meanwhile, many state budgets, facing shrinking revenue, have also drastically cut arts spending, narrowing grant possibilities and forcing artists to seek other ways to make ends meet. Everyone from nonprofit directors to individual artists feels the strain. If this is a new, or newly severe, sensation for many, it is business as usual for Spindleworks, a nonprofit art center in Brunswick, Maine, dedicated to giving adults with intellectual disabilities the opportunity to follow their passions. Since 1976, Spindleworks has provided artists with the materials, studio space, and instruction to pursue their creative goals – from painting to weaving to woodworking – and the gallery settings to show and sell their work. 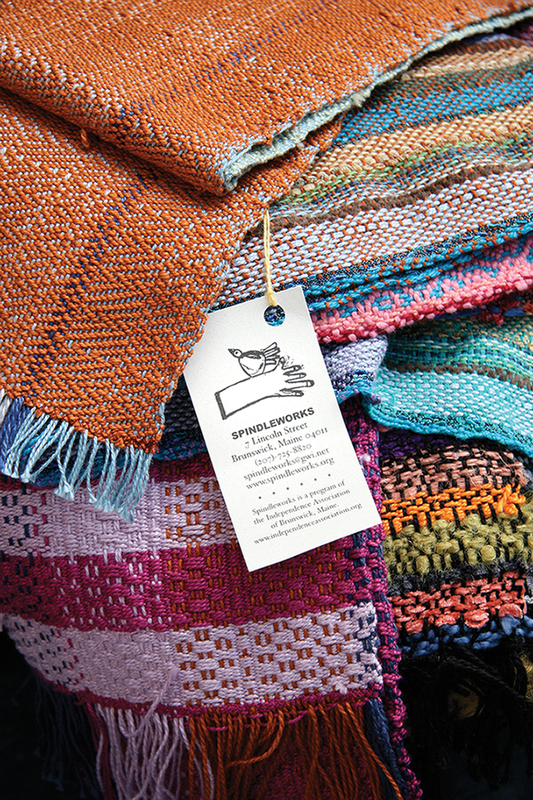 Three-quarters of the profits from Spindleworks sales go to the artists, with the rest returning to the program for supplies. It is a life-changing program, but one always bracing for the next budget cut. “We are an arts organization that is funded under a medical model,” says associate director Brian Braley, “so we don’t necessarily fit into the box of traditional supports.” Spindleworks receives the lion’s share of its funding from state Medicaid programs, with the remainder coming from charitable donations and grants. Its heavy reliance on government support means the organization feels changes in policy especially keenly. In 2016, the program narrowly escaped a state budget cut of up to 30 percent, and the proposed changes in Medicaid, part of the legislation to replace the Affordable Care Act, loom large: The plan would turn Medicaid (now provided without a financial cap) into a block grant, a finite amount of money states could decide to allocate as they please, resulting in winners and losers. Despite these challenges, the program perseveres. “As artists, we are resourceful in making good use of these funds,” Braley says. Spindleworks continues to support 47 artists, who use its facilities anywhere from weekly to daily. Their work is impossible to summarize, spanning a range of mediums and perspectives. Grace McKenna, a painter, ceramist, and knitter, makes masterful pillows, belts, and jewelry. Lloyd Whitcomb, who works in watercolors and weaving, has a gift for layering and color. 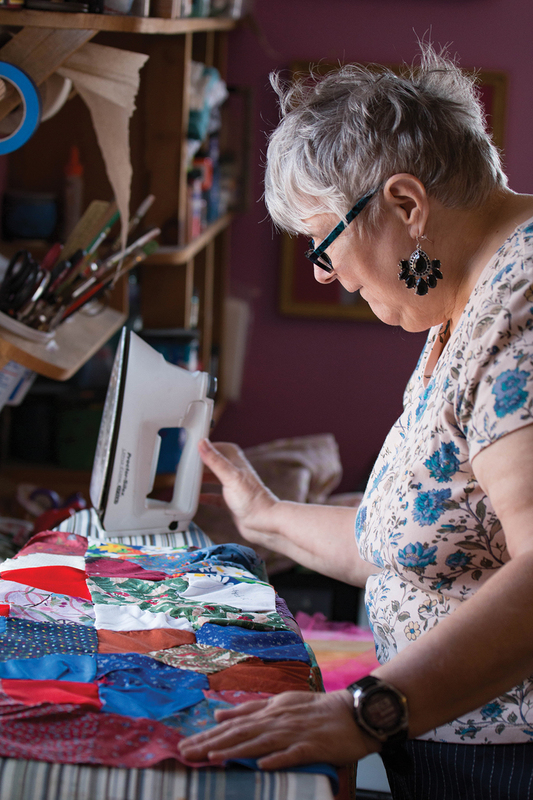 Members of Spindleworks attend occasional workshops in their medium and craft, but no one issues decrees on materials or subject matter; they are free to make what they want, be it a reinterpretation of old movie posters or an intricately woven rug. Remarkably, that care is far more evident than the struggle, especially to the artists who benefit from it. McKensy Brown, a fiber artist and painter who joined Spindleworks in December, sings the program’s praises and says she would recommend it to anyone. “It’s just a good place to come, a good way to socialize and make new friends,” she says. In her few months there, Brown has learned and honed knitting skills, and she loves the workshops, which generally involve five to 10 artists per instructor. 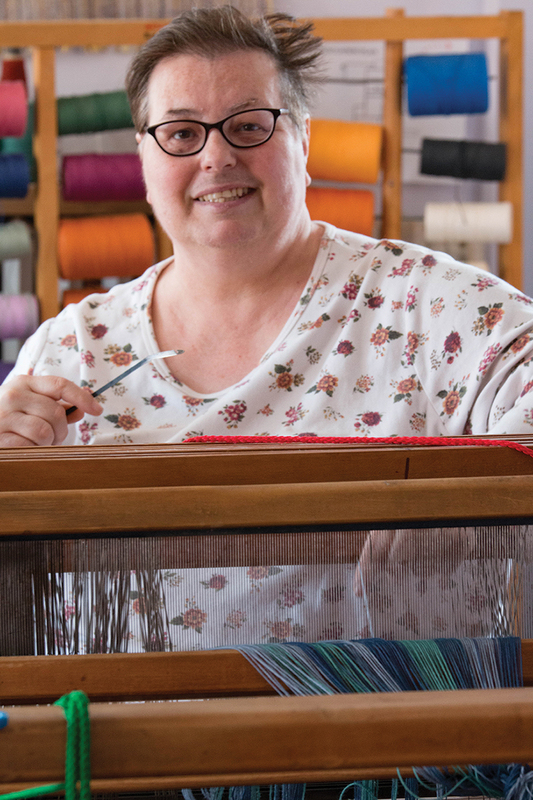 Theresa Labrecque splits her time between Spindleworks and teaching weaving at a local elementary school. Spindleworks artists sell their work on-site and in nearby galleries, receiving most of the proceeds. 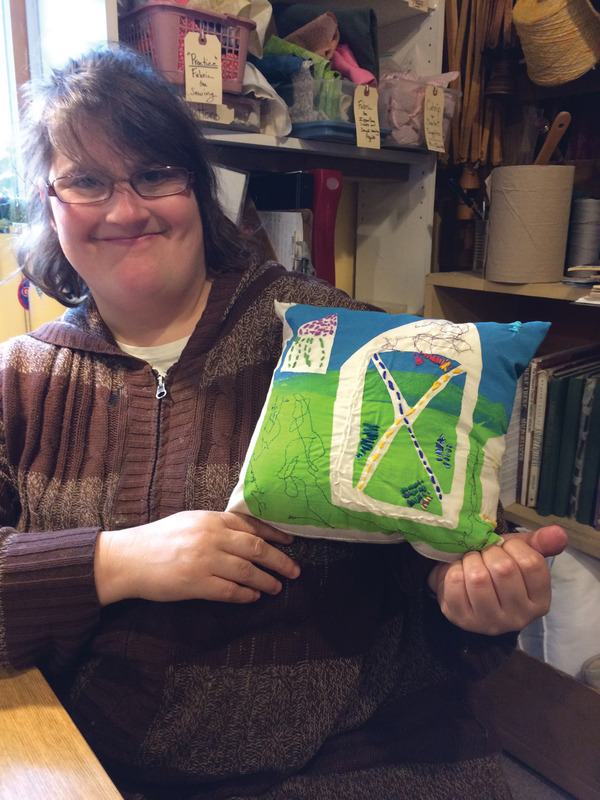 Barbara Carter shows off a recent creation. Betty Carter smooths out a quilt.